Day 8 of our 12 Days of Cookies extravaganza thing, and I decided to try something brand new. I felt fairly certain that I had not had kourambiedes before, though I’ve had many variations on the butter cookie, so gave these a go. The discussions on Gourmet regarding this recipe are quite lively, and it seems apparent that these are a beloved cookie and each Greek family probably has its own secret version. After choosing these, I read the first instruction which says to cream the butter for an hour. Whoa! Good thing the instructions call for a stand mixer, because I’m not sure I’d want to stand in one spot moving a hand mixer around for an hour. In the end, I felt the butter had met the “almost white” criteria at 20 minutes and moved on with the rest. They are very easy to shape and work with. The original recipe doesn’t mention removing the cloves, but one commenter mentioned the necessity of that—try biting into a whole clove and see what you think—so I did it as soon as they were cool enough to handle. We liked the cookies, which have subtle flavors and a slightly dry texture, though we felt they needed something. They aren’t overly sweet, a welcome break from the sticky sweetness of the bar cookies, but they needed another touch of flavor. One commenter mentioned that instead of rolling in powdered sugar, his grandmother drizzled orange juice over them as soon as they cooled, and we thought that was a grand idea but didn’t get a chance to implement. Be sure to visit all our friends in the cookie clan to see what cookies they chose as well as the Gourmet website to see all their favorite cookies from 1941-2008. In the bowl of an electric mixer cream the softened butter at low speed for 1 hour, or until it is almost white. Add the confectioners’ sugar 1 tablespoon at a time, the egg yolk, and the orange-flavored liqueur and mix until combined. Blend in the flour and almonds, 1/2 cup at a time, to form a soft dough. If the dough seems sticky, chill it, wrapped in wax paper, for 1 hour. 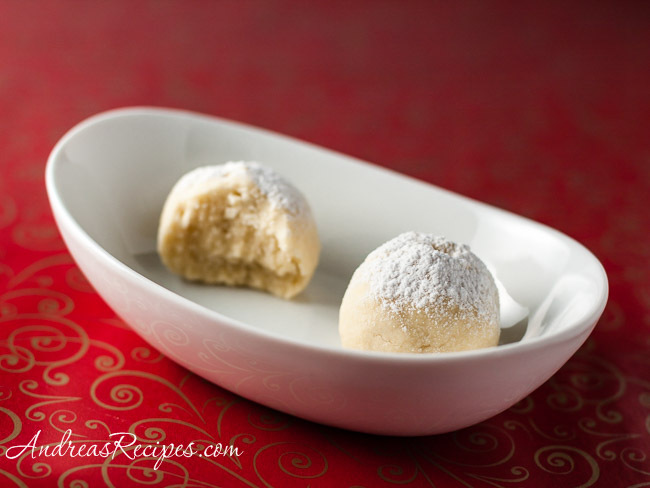 Form the dough into 1-1/2-inch balls and press 1 clove into each ball. Put the balls on baking sheets and bake them in the preheated oven for 15 minutes, or until they are pale golden. Transfer the cookies to a rack, let them cool for 2 minutes. Remove the cloves and dredge them in sifted confectioners’ sugar. Drizzle some rose water or a little orange liqueur over the cookies when they come out of the oven. LOL at the lively comments…Greeks can be passionate! I’m glad you chose to highlight Kourabiedes, a standard at the Greek Christmas table. Try some at a Greek home(s) and you can decide which version you like best. Funny that we both made these and posted on the same day!!!! I hated these cookies! For me there were no redeeming qualities and one of my friends almost gagged on the dryness! Glad you had better luck with them than I did! Sorry these were frustrating. I was tempted to make these but felt the viennese cresents were too similar. Nevertheless they look good and Im sure will not got to waste. These look like yummy little butter balls! I know they weren’t exactly a hit with all of us, but I’m still interested . . . a have a soft spot for those cakey cookies. Yours look beautiful! That’s an interesting recipe… and they look cute. Once the cookies cool you need to sprinkle Rose Water on hem. that is the trick! I LOVE these cookies and I’m not even Greek. I’ve been making them for 35 years. (Yep, I’m old!) I’ve never creamed the butter for an hour …ever! Maybe 4 minutes at the most and they always turn out really well. You need to remove the clove immediately upon removing them from the oven and then sprinkle with shifted powdered sugar. After they’ve cooled I add even more shifted powdered sugar. I love the hint of clove in them. They’re great and look beautiful on your Christmas dessert table! Thanks everyone! Peter, we decided to pour some orange liqueur over them and let them sit for an hour or so to soak up the liquid. All gone! Yum!